With the unfortunate demise of TJ’s Tarrazu coffee, it’s time to search for another daily drinker. 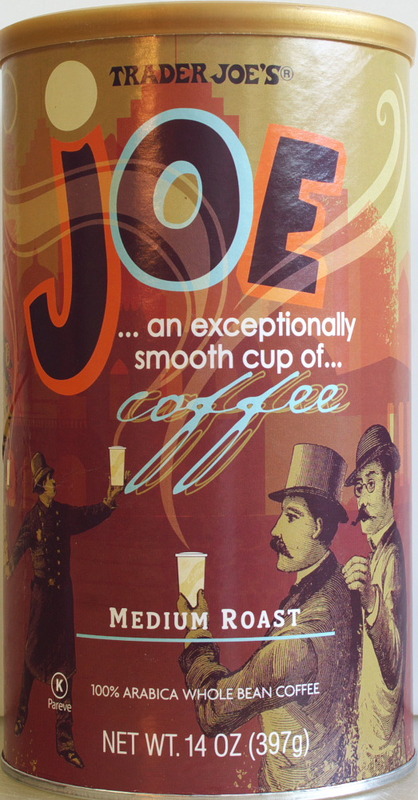 Previously reviewed was TJ’s Joe’s Coffee in a dark roast. Here’s a TJ Joe Coffee, but in a medium roast. While this medium roast is drinkable black, it’s not entirely likeable that way. There’s just something missing in the flavor along with an unpleasant aftertaste. Eventually I resorted to adding some vanilla flavored almond milk to the coffee to make it more palatable. My preference for additives to not-so-good coffee is half-and-half or Irish cream. Neither of those two was in the house. At any rate the almond milk made the coffee more enjoyable, but still not what I’m looking for. The beans in this medium roast coffee, appear to be roasted just right. They have a nice brown color and just about no oil on the beans. There’s not much aroma coming from the can when opened. There’s a surprisingly full mouthfeel for a medium roast. But that fullness comes at the expense of flavor and may be responsible for the aftertaste. This entry was posted on 06/28/2018 at 08:20 and is filed under food, Recipes, food, cooking and related items, Trader Joe's. You can follow any responses to this entry through the RSS 2.0 feed. You can leave a response, or trackback from your own site. I agree. I like this one okay. But heck, any store that provides free coffee for taste-testing is awesome in my book. So free coffee always tastes good! Thanks for adding your thoughts. Agreed, this is far from the best at TJ. Even Aldi’s Honduran whole bean coffee is better. In fact the Aldi Honduran is s pretty decent coffee. Yes. And, It is nice to have variations. Good too, that Trader Joe gives patrons the opportunity to be real taste testers of their numerous products. What happened to the Tarrazu? Gone! Don’t know if it’s coming back. If you’re looking for a replacement, you might try a can of the Honduran coffee. I’ve had one good and one not so good experience with Bali Blue Moon, but I also don’t remember seeing that around recently.